Everything you are about to read is All original material from InvestComics. 100% Authentic. No borrowed material ever, 100% InvestComics. InvestComics has been posting some awesome pictures from Wizard World Philadelphia Comic Con on its social media outlets. You MUST go there and check out the pictures that VP Rafael Rosario has been sending our way! He was also at the Special Edition New York Con last weekend and sent a boat load of pictures from there too! More pictures coming. Special thanks to Correspondent Stephanie Bloom, who reported back with some images from Wizard World Philly. Thank you Stephanie! One of the most anticipated Superman comics to come has arrived, Superman (2011 3rd Series) #32. Well, it’ll be here Wednesday, but it’ll be here. The new creative team of writer Geoff Johns and artist John Romita Jr. will be taking the reins. The folks at DC Comics are banking on this to be a huge hit. As well they should! This two are talents here! From all of the previews, it looks like it’s going to be a success. DC is billing the event as John Romita Jr.’s first DC work ever. While that may seem true to the masses, there is one thing that DC won’t tell you, but InvestComics will. Well, DC doesn’t have to say anything because maybe they didn’t give Mr. Romita Jr. a check back in 1994 or 1997 either. 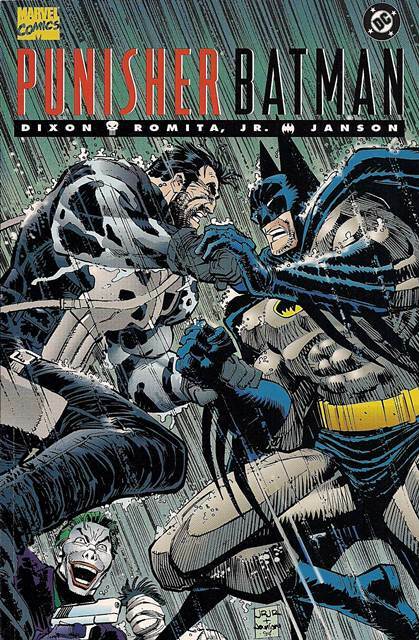 You see Mr. Romita Jr. penciled a book called Punisher/Batman: Deadly Knights in 1994 that featured that DC character in the title here. So what about 1997 you may ask? Well that one is a better book to discuss. 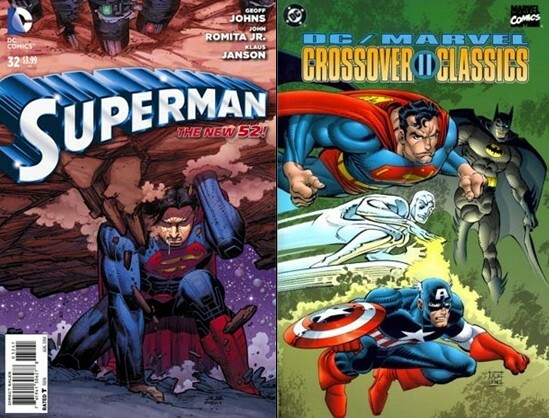 You see, while DC, I guess didn’t give John a check for that 94 book, in 1997 he did a cover for a trade called Crossover Classics. 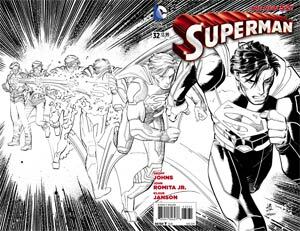 That cover features a John Romita Jr. ……..(ready for this?)…….Superman! Cool right?! So not only is DC’s claim that the new Superman comic coming this Wednesday will be Jr.’s first DC work a bit tainted, but it’s also not the first time he’s drawn Superman professionally. What does this all mean? Well it means that if the new Superman comic heats up, the speculator could probably make a more attractive sale by offering his first true Superman work along with the hot comic. Now if you really want to make some nice cash, here’s what you do. Get either the incentive sketch variant or the incentive variant (the one he’s holding that big rock from crushing him), get them signature series/graded, couple the sale of the trade and your new 9.8 or higher signature series book and you have something very nice that a collector will want. Don’t forget to let them know that InvestComics helped you out with this one…….don’t be selfish. Sticking to the variant/signature series topic for a minute, Savage Hulk (2014) #1 will come with fanfare that seems a bit less than stellar. This shouldn’t deter the speculator from grabbing a possible gem here though. It’s an expensive grab, but one that could pay off. With the hyperbole of the new series comes a very scarce Alex Ross sketch variant. The variant could run you anywhere from $250 – $300 easily. Get an Alex Ross sig with a 9.8 or higher grade and you have a nice turnover here. A funny thing I ran across while doing research for this week’s InvestComics Hot Picks article. Maybe someone can bring some clarification for me. Wolverine (2014 5th Series) #9 has two covers that appear to be the same, but one claw seems to be broken on one of the covers. 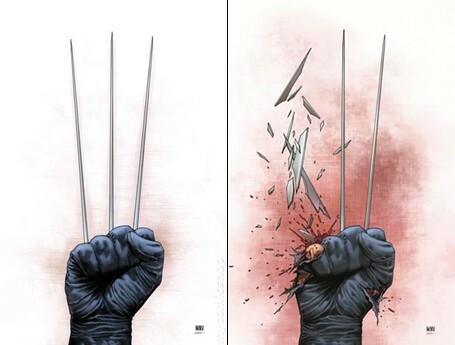 The listing for the comic has the broken claw as the regular cover, but then the other variant cover (cover not shown within the solicitations) is done by another artist. It looks like the same artist, same cover, just a broken claw. Are there 3 covers to this comic? Take a look at the covers in this article and you’ll see it’s the same thing minus the claw. Strange……anyway, if anyone is gearing up for the whole Death of Wolverine comic, you may want to pick up the new Wolverine book this week. The end begins here for Logan. If you know the current market, you know that there is a big comic coming from Image this week. Outcast (2014 Image) #1 is not to be missed. Even if you’re not a fan of Robert Kirkman, the Outcast #1 will be his first horror book since that zombie one that seems a tad successful. Buy this comic. number four. That issue will be her first “official” appearance, but for now we get drips and drabs of her as a girl getting bit by a spider, shooting web, etc. in each issue. In issue number three, we see more of “this girl”. Silk will be a force when she arrives. Be prepared. The Power Ring will be “all-new” in Justice League (2011) #31, the first appearance of the new Power Ring. The first appearance of Power Ring was back in 1964’s Justice League of America #29. Adventures of Superman (2013) 2nd Series #14 will feature a Sugar and Spike back story. Sugar and Spike date all the way back to 1956 in their self-titled book, which happens to be their first appearance as well. Back a year or two or three ago, Alien Legion was on tap to becoming a movie. These days, much of that talk has died down. This Wednesday however, Alien Legion will make its triumphant return in Alien Legion Uncivil War (2014) #1. Since much of the movie talk died down, Alien Legion is readily available for any of the speculators out there. Do yourself a favor and buy the Alien Legion #1 (1984) from Epic Comics because the new book will probably sell out and have all eyes set back on the Alien Legion franchise. In some cases, some of you can find the 1984 comic in the one dollar bins at your local shops. InvestComics reported the Kickstarter campaign for Mighty Titan a while back. Now we can all bask in the awesomeness of Mighty Titan (2014) #1. Dealing with the harsh realities of cancer as the subject matter here comes a hero. This sold out comic will turn some heads. Other definite about to be sold out or sold out comics to check out this week are; Cartoon Network Super Secret Crisis War (2014) #1, Saga (2012 Image) #20, C.O.W.L. #2, 64-Bit Zombie (2014) #1, and Spider-Man Spectacular (2014) #0. For that Wolverine Cover, it appears that Issue 8 starts the 3 months to live. That cover has his three claws on it as a countdown to his death. That is why issue #9 has two claws counting down. I would expect the next issue to have his next claw shattered and him being even more scrapped up.